Try it on chicken, pork, beef, burgers, turkey, ribs, brisket, bake beans, grilled shrimp, ham & pineapple pizza, mac n cheese and sprinkle on French fries & pop corn! 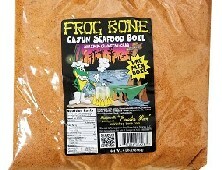 Frog Bone Seasonings taste exceptional on a wide variety of meats and foods. 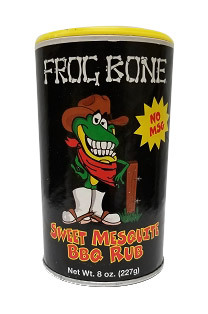 Frog Bone's Sweet Mesquite BBQ Rub adds that great Mesquite flavor to any meal or side dish. It has NO MSG and is Gluten Free. Geaux Creole Dust and Rub, 10 oz.